Doing business across borders adds complex layers to your enterprise. But moving payments into other currencies should be simple. At least, that’s what we believe … and that’s what our latest podcast guest believes. He’s built an entire business on the premise of ethical, common-sense trading. 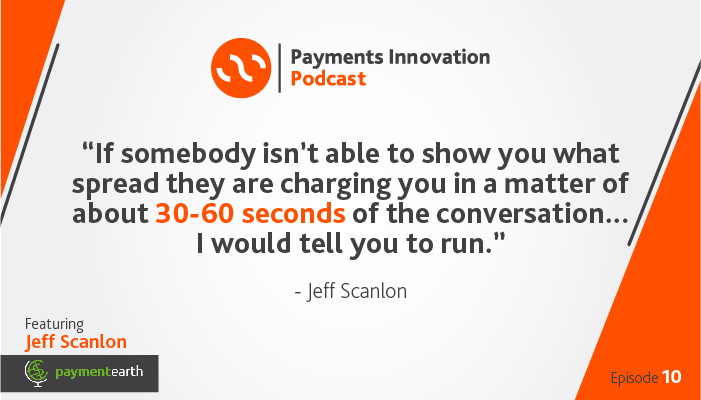 On our latest podcast, Jeff Scanlon, CEO and President of Paymentearth, joined us to unravel the complexities of FX payments. Previously, Jeff worked at Ruesch International overseeing the LA Territory, and then worked in FX sales for 17 years at Commonwealth Foreign Exchange. Jeff’s transparent and ethical style stood out in the FX world, and customers noticed — Jeff quickly became the top salesperson at Commonwealth Foreign Exchange, and eventually went on to lead the team as the FX Sales Manager. After nearly 25 years in the FX industry, he and a colleague realized that businesses needed a simpler, more transparent option. That’s how Paymentearth was born in July of 2016. Is your FX rate complex? There’s an issue. Jeff has seen how the FX world operates. When you first find an entity to exchange your currency, your rate is often a great deal, and you may never never look at it again. Brokers know, and sometimes count on this. As your enterprise draws your attention to its commerce needs, you continue to make payments through the original FX entity, not realizing that all too often, that exchange rate has moved from what you originally agreed to. Since working for various FX companies, Jeff has seen far too much of these tired ethics, and decided it was time for small and moderate businesses to have greater access to transparent pricing in the FX market. His company, Paymentearth, was built on that premise of transparency, as well as fair and simple pricing. He gave us his ground rules for operating in the FX world. He says everyone should be playing by them. To Jeff, there’s no reason for unfairness: In the digital age, anyone can check the prices of any currency at the click of a button. Your broker should be giving you the rate they promised, every time. Further, there’s no reason for that spread to continually fluctuate. Every broker should be upfront with their pricing, give you a fair rate, and stick by it, and Jeff is unwavering in his approach to this transparency. He’ll quote a potential customer a rate. Then he’ll tell them to find the spot rate on the currency from a third-party news network or online and then go to his website. Every single time, they’ll see the numbers line up. Exchange rates aren’t complicated — the math is extremely simple. Call your broker. They should be able to explain your rates to you in 30 to 60 seconds. If they can’t explain it in less than 60 seconds? Run. You should be treated as person, not just a number. As fintech corners the market at an accelerated rate, larger banks tend to shy away from direct customer contact. Not Jeff. “We can offer an excellent level of customer service that’s just unparalleled compared to calling into a major bank,” he said, noting phone calls he’ll receive from clients. Fintech has profound benefits. It provides excellent methods of streamlining payments and ensuring efficiency for customers, Jeff classifies his company as fintech. However, Jeff doesn’t believe customer service should be sacrificed on the path to freedom and efficiency. He believes you can have both. Ethical, simple FX is obtainable. As your business continues to grow internationally, and more and more commerce crosses borders, access to international currency becomes increasingly more important. Thankfully, that access can be obtainable, simple, and ethical. You can check out more about Paymentearth here. This post is based on a podcast with Jeff Scanlon. To hear this episode, and many more like it, you can subscribe to Payments Innovation. If you don’t use iTunes, you can listen to all episodes here.